The SV-661WR is a perfect match to its free-standing partner with added benefit of the same amazing performance conveniently wall-mounted. 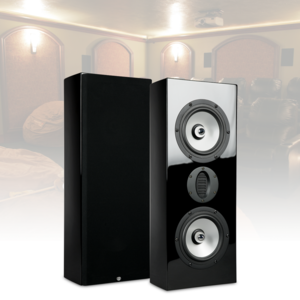 The SV-661WR makes an impactful home theater possible without sacrificing valuable floor space. This speaker can be used as left and right main channels for music and home theater systems, or can also be used as center or surround channels. It can do it all. Of course it is perfectly timbre matched to its SV family partners for total flexibility enabling easy installation of your dream theater and can be located throughout the home for sublime music enjoyment. The versatile SV-661WR utilises dual 6½-inch reference aluminium cone woofers and a proprietary AMT (Air Motion Tweeter) tweeter. Mounting is easy via a “French cleat” system. The Signature SV Reference Series offers enhanced performance due to reference-grade components. The mid-bass woofers produce great bass and midrange due to their advanced aluminium cone woofer featuring a fixed-position phase plug. The addition of this phase plug extends frequency response and prevents acoustic “beaming”. The result is increased power handling and enhanced sonic clarity. RBH Signature Reference speakers incorporate custom designed AMT (Air Motion Transducer) tweeter technology. The AMT tweeter is a pneumatic transducer that utilises a flexible low-mass diaphragm with optimal rigidity and self damping characteristics which is folded and suspended in a highly saturated magnetic field. This low mass diaphragm incorporates an aluminium conductor and has vastly larger surface area compared to traditional dome style tweeters. The benefits of this of this type of tweeter design are extended high frequency response, increased sensitivity, lower distortion and higher dynamic range. High frequency response extends beyond 35 kHz adding a sense of air and detail that surpasses other more traditional tweeter designs. The AMT tweeters seamlessly integrate with the metal cone drivers, providing a sense of spaciousness and realism to the sound-stage that is second to none. To accommodate the higher performance driver components, the crossover networks are modified and fine-tuned to optimise the overall performance of the speaker system. Each Signature SV Series speaker features an extensive crossover network. Steep acoustic slope crossovers are used to integrate drivers. The use of steep crossover slopes allows for higher power handling, minimises driver interaction anomalies, and maximizes the ability of each driver in their respective band of frequencies. The 5-way binding posts ensure a good, solid electrical connection to these crossover networks. The Signature SV Series speaker cabinets are constructed of a minimum of ¾-inch medium density fibreboard because of its inert properties, thereby preventing sound coloration due to cabinet diffraction. The double thickness of the front baffles also prevents acoustic radiation. Experience these remarkable products for yourself. Visit us in the Audio Visual Technology Solutions Room 328.